In case you were wondering, here's the recipe for the Chocolate Tofu Mousse I piled into those cute little Cinnamon Sugar Tortilla Cups last week. This is a great recipe I was first introduced to by a good friend several years ago. I often eat firm tofu but one day I mentioned that I had never found a way that I enjoyed eating soft tofu. Knowing a thing or two about my tastes, she claimed she had the perfect remedy and gave me a copy of her recipe for Chocolate Tofu Mousse. It took me a while to try it. Sometimes I am slow to organize my thoughts around new ideas but, in the end, she was right. This recipe produces a delicious mousse that, even after I added a few extra ingredients, is easy to make. Rich in protein, vegan, potentially non-dairy, and relatively low in sugar and fat this dessert could almost pass as a nutritious main course though the taste is definitely that of a decadent special dessert. While it still sounds a bit strange to me to eat tofu for dessert, the flavor of this mousse is fabulous in every way. In a taste test I would never identify the main substance of this dessert as tofu. To prove my point I offered this "pudding" to my youngest son, the member of my household who is, by far, the most finicky eater. He liked it. Of course I then had to mention what it was made of and I don't think he finished it or has tasted a bite of it since. Further confirmation came when I discovered that Mark Bittman found a very similar Mexican Chocolate Tofu Pudding to be an impressive dessert. He dressed his up in the same way, adding the Mexican flavorings I find so appealing as an addition to chocolate. With those recommendations I feel I can serve this mousse with confidence. It is a perfect dessert when I crave something chocolaty to round out a sparse dinner menu or when I want to share an elegant dessert with dinner guests. In a microwave safe measuring cup or bowl combine the espresso powder, cinnamon, chili powder and brown sugar. Add the boiling water and stir together until the sugar is fully dissolved. Stir in the vanilla. In a medium mixing bowl, combine the tofu and hot coffee spice mixture (warm it up in the microwave if it has become tepid) using a stick blender or other mixer. Continue blending until smooth. 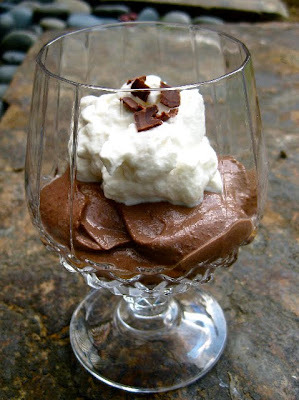 Divide the mousse among 4 to 6 small dishes, stemmed glassware or Cinnamon Sugar Tortilla Cups. Chill until ready to serve. Just before serving, garnish with whipped cream, a dusting of chili powder and/or chocolate shavings, as desired. Note: The mousse in the photographs shows fine lumps. These formed on my first try of this recipe. I think the cause was that the chocolate cooled too quickly when added to the tofu. Adding the hot liquid to the tofu first and then adding the chocolate while still nice and warm eliminated that problem with the second batch I made, described in the recipe above. I would have taken more pictures but I made that batch in the evening and it was gone before I could take advantage of the next day's light. this would no doubt convince even the toughest critic that tofu is worth eating! That is the best looking Tofu I've ever seen! I have made this for my lactose intolerant friends before and it is delicious. You would never know it was made with tofu.